Justin Hamman’s mission is deeply personal. Three years ago, his mother was diagnosed with a mild to moderate form of Alzheimer’s. Even though he was just 17, he had to leave the University of Arizona, where he was a computer science student, and move back home to the Valley to be a full-time caretaker. There is no cure for Alzheimer’s, and the “take a pill” solution to seemingly everything barely worked. So Justin and his older brother, Jacob, have turned to technology to help their ailing mother (temporarily) remember, recognize and rekindle her memory and brainpower. Zenjoi is the brainchild of Justin and Jacob inspired by their mother’s suffering. It’s one of five finalists in this week’s Canyon Challenge, where entrepreneurial ideas created by Grand Canyon University students are rooted in both filling gaps in the marketplace and closing them through helping others. “We’re hoping it can be a kind of light at the end of dark tunnels,” said Justin, a junior commuter student in computer programming at GCU. 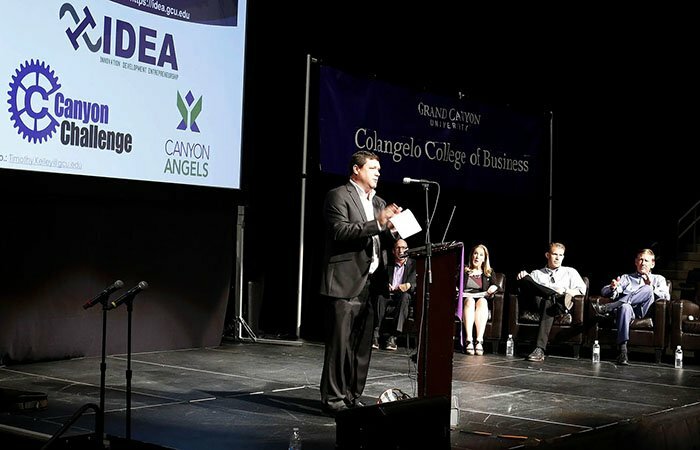 All five business concepts — the others are Storage Together, Secured Together, Outbound Explorer and Coloot — have a chance to move closer to “open for business” as they vie for a portion of $15,000 in total prize money toward their respective causes Thursday afternoon at GCU Arena. Each company will present its business proposal for approximately five minutes, followed by a Q-and-A period. A five-person panel of judges will award the prizes immediately following the presentations (approximately 6 p.m.). Tim Kelley, who helps the IDEA Club manage the Canyon Challenge, speaks at the 2016 competition in GCU Arena. Storage Together is a finalist for a second consecutive year because it didn’t win money in 2016. It did, however, win the Phoenix Smart City Hack Competition last October, then won an international competition in Barcelona in November. The concept connects those in need of storage space for their possessions with those who have space to rent or share. After the Storage Together team tweaked its business plan and model the last several months, Kelley said it’s planning a summer rollout as its first test in the marketplace. One of Storage Together’s creators, Jedidiah Woods, is also spearheading Secured Together, an app that connects anyone on or around a college campus with public safety and selected university personnel (police, university staff, student leaders, etc.). The idea is to report and pin (on an interactive map) any potential safety concerns within and around a college campus in real time. The app also features a 911 button for anyone to use. Woods said they’ve consulted with GCU’s public safety, student affairs and cybersecurity departments for guidance and ideas. The app is being beta tested. Austin Johnson, a passionate outdoors and “action” sports enthusiast, created Outbound Explorer to help anyone interested in activities such as skateboarding, surfing, hiking, kayaking, cliff jumping or skiing to share their experiences and suggestions on where to go using a crowd-based interactive map. The concept has been a couple of years in the making and hopes to capitalize on so-called “fringe” sports that have continued to gain popularity through the X Games. A few (surfing, skateboarding, etc.) will be Olympic competitions during the 2020 Summer Games in Tokyo. Coloot is the project of Brady Harrison and Ricky Morse and aims to help crowd source and crowd fund others’ entrepreneurial ideas and business plans. Kelley said another finalist, Lectric Longboards, withdrew from contention because it no longer needs help with capital after earning nearly $1 million in sales and re-investing those earnings back into the business. He also noted that each of these business concepts align nicely with the “Conscious Capitalism” and “entrepreneurial spirit” philosophies of both GCU and CCOB. That includes Zenjoi. The Hammans bought an iPad and added photos, videos, audio and other forms of memory retention and re-ignition to help their mother — and Justin. “She loves it and talks about it a lot,” Justin said. Jacob Hamman was an architect living in Los Angeles when his mother was diagnosed. 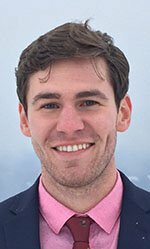 He recently finished graduate school at Harvard and returned to Arizona to be with his mother and work on building Zenjoi with Justin. They’ve had discussions with Banner Health’s neurological sector about Zenjoi’s concept and also about finding clinical trials or studies to help validate technology as a positive and potentially personalized force in this fight. But apart from a lot of Internet searching and a Netflix documentary, “Alive Inside,” Justin found precious little information about ways to help those in the here-and-now without using pills. An Alzheimer’s “cure” appears to still be years away. In the meantime, Zenjoi wants to put “life” back into sufferers’ daily lives.